It is a well-known fact that I love reading the writings of Jesus scholar Larry Hurtado. His latest blog interaction with the work of Paula Fredriksen intrigues me, not only because her work was widely cited in my book on Paul in Chinese, but because of its implications for many HK churches, especially in light of the further call for harmony and tolerance for another fake election by the Anglican provincial secretary on HK TVB. I will cite below what Fredriksen claims from Hurtado’s blog. At some near future point, I will read her work in its entirety at which point I can give it a fair reading. If what Fredriksen says is true, then Paul was not punished because he preached the gospel as people traditionally believe, but because the gospel Paul preached caused disharmony both with society and within the synagogue system. Let’s think about the current culture of the HK mega-churches that tend to speak for oppressive government policies. The best example is from one church where members who opposed oppressive governmental policies would be punished by having their memberships revoked from the church. Other less severe but equally misleading responses would be to call for harmony at all costs without adequate discussion on the issues that divide. I’m going to blog about chapter 18 of my book. I’ve already blogged about it before as a negative example for how to use scripture. In my book, I’ve already established that the passage was not about marriage between believers and unbelievers. Rather, it is about unity between radically different value systems within the church possibly propagated by different parties. I believe this passage has huge implications for HK in the present climate among SOME pastors to call for unity. The Chinese Christian blog sphere also lit up with discontent and outrage. I believe Paul’s teaching prohibits the church from a compromised unity. In a situation where black and white are not neutralized by heavy shades of grey, perhaps, unity is not the answer, as we shall see below. The passage talks about being yoked together possibly borrowing from farming practice of putting two different animals together to plow. In this metaphor, Paul was talking about working together with unbelievers, but was Paul’s writing a total prohibition on working with unbelievers? I don’t believe so. The subsequent verses show that certain anti-Christian results that came from working with unbelievers such as idolatry. In other words, you can’t work with unbelievers if the results go against the fundamentals of Christian value. For believers who may be tempted to link themselves to such anti-Christian values, they ought to separate themselves. This is the essence of Paul’s message. Let’s look at the HK situation. The fault line between the two parties in the church is political where one party sides with the government and the other does not. Before we call for reconciliation and unity, let’s see what reconciliation consists of. The most successful example of recent history is the Truth and Reconciliation Commission in South African abolition of Apartheid. In fact, this bloodless revolution has caused other countries to form TRC’s, countries as varied as Colombia, Nigeria, Canada and so on. In reconciliation, those who are wrong do not get an easy escape. They confess that they’re wrong not because they hold a different opinion and reject others’ opinions, but because they actually hold the WRONG opinion about race and politics and must confess their falsehood. Bring that to HK. Can anyone honestly say that siding with the government that lies repeatedly to its own people is RIGHT? Is oppression and dishonesty part of our Christian value system? We don’t need to sweep rubbish under the table right now. We need separation from lies. We need truth, even if that truth tears our church asunder. This recent protest movement has become the mirror in the church to show where everyone stands in relation of oppression and dishonesty. We need those who have supported lies in the faith community to 1) confess their sins 2) to separate from such anti-Christian values. The preachers from those rich and large churches who have sided with governmental oppression should be the first to come out and confess their sins! I dare them to be an example to the flock by following Paul’s advice. IF our church leaders are willing to take such harsh and courageous steps the way Desmond Tutu did, I’m all in favor of reconciliation and unity. Otherwise, count me out! So, if you want a Christian way to do unity and reconciliation, read, meditate and apply 2 Corinthians 6.14 for its real meaning instead of going for cheap unity because cheap unity will create more injury in the long run. So, for now, give me a break from this cheap unity talk because such unity is not just untenable; it’s immoral. The word “sincere” means something like “not-pretencious”. This is not an exegetical blog. Instead, I want to share something personal and important from a recent experience. An elegant elderly lady approached me after my sermon the last night in Toronto. She asked me a most unexpected question, “Did you go to Kowloon Tong Primary School?” I said, “Yes.” She then said, “I remember you. I was your teacher. You were the VP of the class. The president of the class was more heavyset. I always knew you were a bit special.” It’s one of those awkward moments in my life that I was totally left speechless. From a very vast immigrant audience that packed the sanctuary, I get this strange out-of-the-blue comment. Finally, after I came to my senses, I said, “You must be mistaken. I was no VP material at that age.” She said, “No, I’m quite sure you were because your mother used to put her hair up in a bun and wore a bit more traditional Chinese clothing when she walked you to school.” Then, she smiled. I’m sure my teacher was right. Never argue with your teacher! The awkwardness of this moment was heightened by the long line of people waiting to talk to me or to have me sign books they purchased at the conference. I eventually thanked her and she said a blessing to me. Everyone moved along as usual. Whew, that was awkward. You know what I hate? I hate it when people say to me, “Oh, I remember you when you were a tiny tot. Wow, look at you now.” Most of the time, people just wanted to show me that I’m still a little kid and to show me how successful they’re now in whatever profession they pursue after losing contact with me. Having met people all over the world, I can smell condescension when I encounter it. Luckily, this doesn’t happen often, but since Chinese people move all over the places to places where I speak, this happens more than I care to admit. However, this conversation is different. I have to admit that I choked up slightlyand anyone who knows me knows that I don’t do choking up. She really seemed very sincere and looked genuinely proud of me. I think we all wanted to please our teacher deep down inside, especially the good ones, ever since we’re little. And to hear that from a former teacher is quite something because I’ve always remember myself as a fun-loving ADHD knucklehead who was often sent home a teacher’s note about how I didn’t pay attention in class. My favorite time was recess when I could play soccer on the school’s sandy pitch or play pranks on my classmates. Those are my childhood memories. She remembered something quite different. What touched me was the way she remembers the things I didn’t, things that really don’t matter now, but still, things that are small details. This teacher cares. My point is not so much to brag about how special I was because to me, I’m just an ordinary bloke doing a job. The most special part of this experience is see that after all these years, I see a teacher who really cares about her student. She didn’t care by making me get better grades, though my grades weren’t the worst. She cared because she noticed the little things like the way my mother wore her hair or how the president of the class was a more heavyset kid. This is something we can all learn from. Taking the time to care is an important trait for a person of great influence and character. Perhaps, my teacher isn’t as famous as I am in the faith community, but I’m sure, she inadvertently influenced me to be who I am today, and for that, I thank her. Whatever your name is, I thank you for stopping by and sharing your life with me now. You’re a person of great influence and character, perhaps more than you ever know. Take the time to show some love to someone today. You never know how that will affect the person in the here and now or in the long run. Please continue to join me and Grace as well as thousands of others to pray for the release of Kenneth Bae. Nov 3, 2014 marks 2 years in prison for Kenneth Bae. 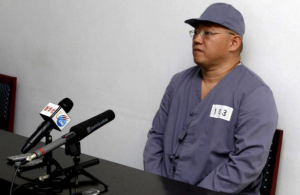 We must continue to pray for his release from a prison in North Korea. I am reposting a co-written piece with Rev. Jesse Jackson for The Nation that came out earlier this year.